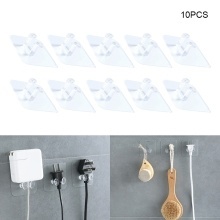 This adhesive hook is used to place power plug and make your place neat and clean. Have great load-bearing and stickiness. No trace adhesive. Good adhesion and transparent design. The hook is versatile and can be used to hang small objects. Both two-phase and three-phase plugs are suitable. The power cord is no longer messy. Note: Due to the light and screen difference, the item&apos;s color may be slightly different from the pictures.